The AB-256 wall mounted solar fan is designed for commercial applications which require a wall mounted fan for warehouse spaces, workshops, and other open area ventilation requirements. The unit may also be used for residential attic ventilation if a wall mounted unit is desired. 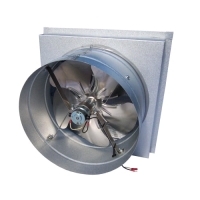 The unit comes with a remote mounted high-efficiency 25 watt solar panel, low profile mounting brackets, corrosion resistant zincalume vent housing, and 14 inch aluminum fan capable of producing over 1550 CFM of airflow. Vent housing comes complete with flush mounted louvers, ¼” mesh rodent screen, and wall mounting box. The solar panel can be mounted up to 15 feet away from fan unit or up to 40 feet away with remote mount cable upgrade option. Fan unit comes standard without thermal switch for open area ventilation applications. Thermal switch can be added upon request at no additional charge.